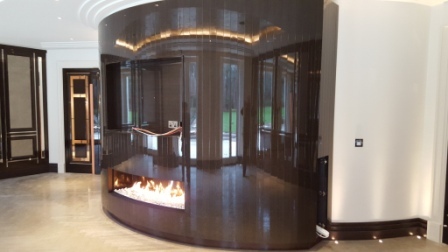 This unique curved gas fireplace was the second curved fireplace burner we installed in an amazing new build property in Wentworth. 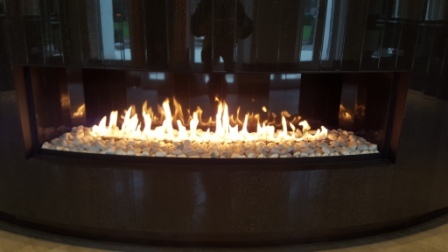 Our job was to fit a total of four fireplaces at this property. The whole project from start to finish took over two years of planning, designing, building and finally the installation process. In addition, the curved fireplace came complete with a new twin wall flue system and Exodraft fan unit. A television was also fitted directly above it. 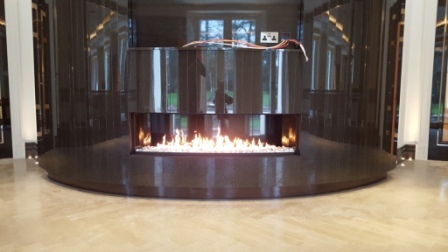 As a result it is one of the most ambitious and stunning fireplaces that we have fitted. Take a look at the other curved gas fireplace in a games room.